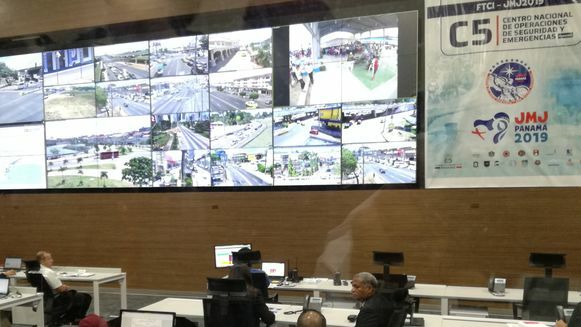 A surveillance system introduced for the visit of Pope Francis was inaugurated by President Juan Carlos Carlos Varela on Monday, January 21. The National Security and Emergency Operations Center C5- located at the National Police HQ in Ancon may turn out to be one of the lasting benefits of World Youth Day (WYD). The system includes vehicular identification arcs on highways, equipped with plate readers to facilitate the detection of vehicles involved in accidents or in the commission of criminal acts. In addition, from C5, security and emergency agencies can track the location of incidents in real time and send it to members of the nearest security bodies reducing the response time said Public Safety, Minister Jonattan Del Rosario. The center also incorporates a set of computerized systems for reception, attention, and dispatch of emergency calls with geolocation, video surveillance towers, panic buttons, facial recognition, and video analysis. I stayed a month there on my first visit and fell in love with the culture, people and of course the great country itself. I started spending more and more time there and eventually splitting my "vacation" time (six months of the year) between Panama and Colombia. The rest of the year I spend in the States in Florida and a little traveling in an RV. BTW these cameras are plentiful in certain areas of Colombia. When in Panama I usually stay In Coronado. I split my time in three countries. Agree. Richard, out of curiosity, where in Panamá do you live? I live in Panamá Oeste. Welcome to "Orwells 1984". Get used to it, it is everywhere in the States.